Water vapor trapping with a Polycold was a concept developed by Dale Meissner in the 1970's as a way to speed pump down of vacuum chambers and to reduce the base pressure to enhance vacuum coating. In pumping a vacuum system, you can either remove molecules of gas from the chamber or as in the case of water vapor change the state of the gas by condensing (trapping) the water vapor molecules on a cold surface. When pumping a chamber from atmosphere, between ~10-3 to ~10-8 Torr, 65% to 95% of molecules in the chamber are water vapor. Whenever a vacuum system is opened to air, the internal surfaces of the chamber will be covered with layer upon layer of water molecules. The thickness of the layer will depend on the relative humidity of the air, the exposure history, etc. As vacuum pressure is lowered in the chamber this water vapor releases from the walls and surfaces of the chamber and then must be pumped or trapped to further reduce the pressure in the chamber. A mechanical trap like a Polycold or MegaCold, uses refrigerant to cool a stainless steel or copper coil in the chamber. Ability of this coil to trap water vapor is mostly based on the amount of cryogenically cooled surface area in the chamber. As water vapor is released off the walls or other internal chamber surface, they must be either pumped or trapped to further reduce the vacuum pressure in the chamber. If you increase the amount of coil in the chamber the ability to trap water vapor molecules as they "bounce " around the chamber increases. A 50,000 l/s high vacuum pump reduced in efficiency by 50% provides maybe 25,000 l/s in pump speed. So to get to 100,000 l/s, you need 4 of these pumps which is not practical due to cost and space concerns. 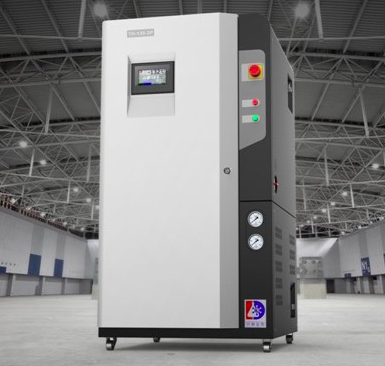 A Polycold PFC 1100HC or MegaCold 50Ain conjunction with a 5/8" coil design of about 120 ft in the chamber can produce in excess of 100,000 l/s of water pumping speed or 4X the high vacuum pump. Compared to the small inlet of the high vacuum pump, the coil in your chamber is a great target for the water vapor molecules to hit! So without the Polycold, it could affect the time to pump the chamber 4x or more! 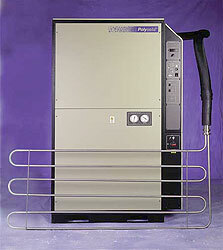 Polycolds or MegaColds are vital to quickly evacuate vacuum chambers for production applications. In addition to speed the elimination of water vapor molecules in the chamber reduces the vacuum base pressure and in many applications improves the quality of vacuum coating. Increasing the surface area of the copper or stainless coil with the proper size Polycold or MegaCold, can result in increased production. I have found when customers have bigger projects, first equipment to get quotations on are the bigger items like vacuum pumps. This makes sense in that a vacuum pump can be a longer lead time item that is critical to acquire to meet project time frames. After the first "big ticket" items are purchased, customers work their way down until the last items ordered are all the miscellaneous hardware items that are usually in stock. Many have heard the saying GOOD FAST CHEAP...you can get two but not all three. Good and Fast..... is not Cheap. Fast and Cheap..... is not Good. Cheap and Good.... is not Fast. So one way we have found cost savings for customers is to concentrate on the smaller items upfront. If we can get a list of vacuum pump hardware items early in the project, we can provide the GOOD hardware at a CHEAP less expensive cost. Send us your Bill of Materials for your project. To get started, visit our Vacuum Components Page or to send us your list for quote, go to Contact Page and upload. The refrigerant commonly used in air conditioning systems until 2010, R22 Refrigerant Gas, is being phased out of production and imports in the USA starting January 1, 2020. For Polycolds manufactured before 2008, new refrigerant will become unavailable as that refrigerant contains some R22. Models of Polycolds affected end in 00 such as PFC 1100HC, PFC 550HC and PFC 670HC. These Polycolds will need to be rebuilt to take the new refrigerants or replaced with new units. Rebuild costs are approximately 30% the cost of a new unit. Once rebuilt, Polycolds should have a similar maintenance life as a new unit. Since the rebuild expected lifetime of a rebuilt Polycold is 8-10 years, units rebuilt in 2018 with the old refrigerant will be obsolete if they need new refrigerant after the phase out. Thus we recommend rebuilding units now to take the non-HFC blends. Contact us for questions, quotes and info at the link below. Does anyone still remember the Yugo? 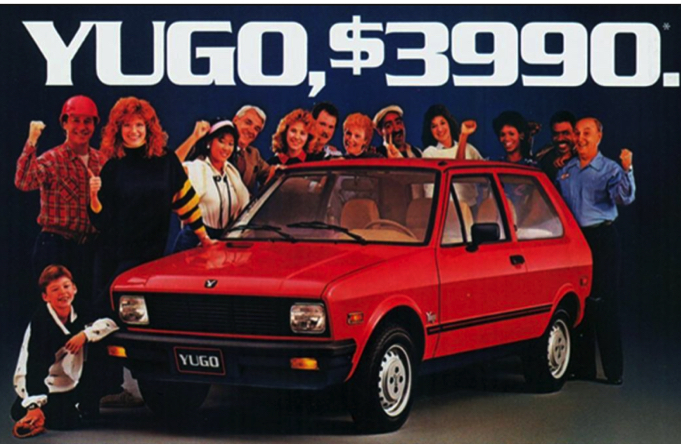 In the 1980's the Yugo automobile was produced in Yugoslavia and sold in the USA. Turned out it was one of the worst cars in history. Today, they have all but disappeared to the shredder as scrap steel. What was cheap in that case was not necessarily good. My experience in leak checking applications is that it is thought, if a product will not form a bubble (either being dunked in water or sprayed with a soap solution) the product is leak tight. What is not understood is the leak rate that bubble really represents. In reality, every product leaks. The leak check determines if the leak is below the acceptable leak rate. Bubble testing is cheap. It is also visual. So the cost and training is minimal to get into operation. Operators understand a bubble forming, and thus can quickly get up to speed in finding leaks. Because it is visual, the operator gains confidence quickly that leaks in the product are found. Is there a better method available? The next method up the leak checking food chain is getting rid the soap bottle or tank of water and replacing it with a handheld sniffer leak detector. Traditionally, a helium leak detector is chosen for consideration. These helium detectors start at several thousand dollars and can end up at $15k or more if a mass spectrometer is required. Helium gas is needed to fill the test object. The new technology available is with a hydrogen leak detector. Before you think Hindenburg...wait.... the tracer gas is a mixture of only 5% hydrogen & 95% nitrogen. In nitrogen, hydrogen does not become combustible until the concentration is 5.7%. So this is green label gas. The hydrogen leak detector cost is right at a $1000, so much less than helium. Cost of the gas is 1/4 that of helium. And how much better than bubble testing is sniffer leak testing? 1000 times better or more....hydrogen leak detectors will find leaks that will not even form a bubble. Visit the website page below for more information. There you can ask us for our 30 day money back guarantee if not satisfied. The tracer gas method for locating underground pipe or pipeline leaks has been around for many years. Original technology was with a helium leak detector. Helium tended to be difficult to justify using as the helium mass spec is a very complex instrument that is very expensive. Helium while a small molecule is expensive as it is a gas that is mined along with natural gas. In the 1990's telecom rush to lay optical fiber for broadband internet, technology for hydrogen was improved to provide an alternative for helium. Once that boom ended in the early 2000's the hydrogen detection method cooled due to the lesser demand. At the time, cost was a factor and only the most lucrative applications could justify the equipment. Several companies, mostly in Europe, also developed less expensive detection equipment, to fuel the demand for locating water leaks. Hydrogen is a very good gas for tracer detection. As hydrogen leak detectors improved in technology, the ability to reduce the concentration to 5% H2/95% N2 fueled the change from helium. The 5%H2/95% N2 is approximately 25% the cost of helium. To reduce cost, always ask for industrial grade 5%H2/95%N2 with no certificate needed. It is not important that the tracer gas be 99.999% pure nor do you need that certified. Always ask though as gas companies tend to provide the research grade gas. the 5%H2/95%N2 is completely non-flammable and non-combustible. It is a totally environmentally friendly gas. Hydrogen as a tracer is an ideal gas. Hydrogen is high energy and tough to contain. This works well for leaking from an underground pipeline as the hydrogen can penetrate both asphalt and concrete. Hydrogen also moves straight up and the leak should be able to be located above ground in a 3ft. circle. Depending on the depth of the pipeline, the hydrogen mixture may need to be put in the pipe the night before. For water pipes near the surface, 30 minutes can be sufficient. Feel free to call us with any questions. 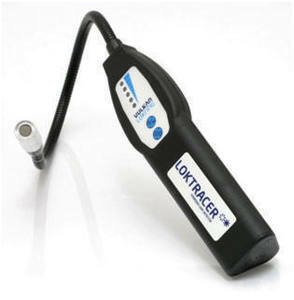 Schoonover provides a low cost hydrogen leak detector called the Hydro-Lok. Cost of the Hydro-Lok kit including regulator, probe stick and lines are priced at $1499. 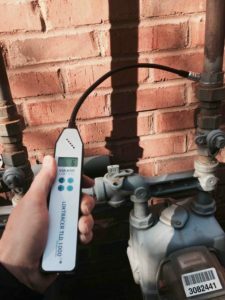 Our aim is to provide a quality low cost hydrogen leak detector priced for all leak detection professionals to be able to take advantage of the technology. Pressure and leaks go together. More leaks cause you stress and for that Dr. Phil may be the answer. But what about test gas pressure in your test object. 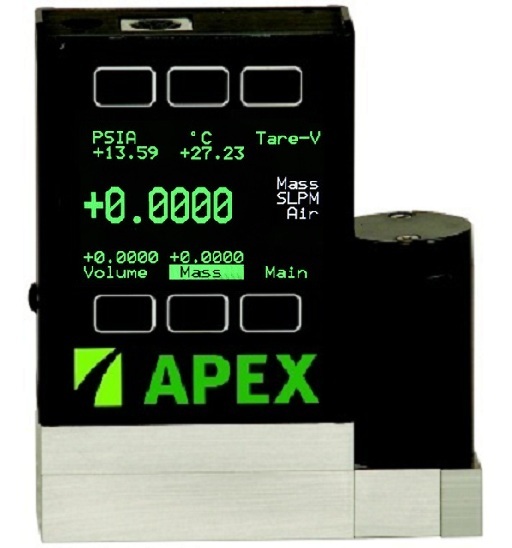 Will not being concerned about pressure in your test object give you leaky parts that fail in the field? The answer is yes and that should be cause concern or an increase in pressure of the Dr. Phil variety. When visiting production leak testing customers, everyone seems to have a good idea of their leak rate. I visit a lot of customers sniffing for helium and/or hydrogen. At these visits I ask them their leak rate specification and are commonly told “ Our leak rate is 0.10 oz/yr of R410A”. But in reality, what they should have said was “My leak rate specification is 0.10 oz/yr at 400 psi”. It makes total sense that as you increase the pressure,in the test object, the leak rate increases. Most of the time in sniffing the tracer gas, the pressure is kept to a maximum of 150 psi as a safety concern. But many times, the operating pressure of the unit is up to 400 psi. As you increase pressure, the volume of test gas used increases. With the cost of helium rising there is a temptation to reduce the test pressure to save money. So how much difference can pressure make? Q= Leak rate in atm. cc/sec. D= Leak Diameter in cm. n= Gas viscosity in bar sec. L= Length of leak in cm. P1= Test pressure on one side of leak (bar). P2= Test pressure on other side of leak (bar). Looking at the equation, you see that pressure is squared, thus a product in operation at 400 psi (27.2 bar) compared to testing at 150 psi (10.2 bar) is quite a difference. So the product operating at 400 psi, that leak shown at 150 psi is now 289 times larger. 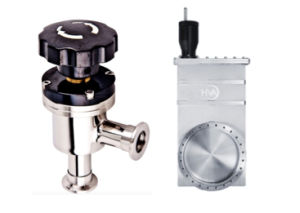 Moral of the story is that if your product passes a 0.10 oz/yr leak test at 150 psi, in the field running at higher pressures, the real product operating leak rate is much larger than the low pressure test leak rate. Schoonover Inc. ( www.schoonoverinc.com ) represents companies for helium leak detectors and helium leak testing systems. For further questions on your application contact us at 800-331-2808 or at info@schoonoverinc.com. One principal of high vacuum that is easily understood is the concept of water vapor in a vacuum chamber. If you live where I live in the deep south part of the USA, humidity or water vapor in the air is easily understood. Obviously, this water laden air is also in the vacuum coating chamber, lining the walls and surfaces of the vacuum chamber. 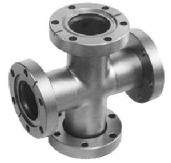 When a chamber is pumped to a pressure of 10-3 torr or below, most of the chamber’s volume gas has been pumped away and water vapor becomes the predominant gas within the chamber. At this point the reduction in pressure is controller by the rate of water being desorbed from the surfaces inside the vacuum chamber and that water molecule finding its way to the inlet port of the high vacuum and being pumped out of the chamber. More than likely, a water molecule desorbing will simply find its way to another surface inside the vacuum chamber to again re-sorb on the surface. So where is the basketball shot blocker reference? Imagine a three point shooter in basketball. The best player makes 40% of his shots and he is highly skilled. Compare that to a water molecule in a vacuum chamber that is not highly skilled at all to find the inlet to the "basket" in a vacuum system or better known as the inlet to the high vacuum pump. So what we need is better skilled water molecules able to land in the inlet? Well yes but scientifically not practical. The Polycold coil inside the vacuum chamber acts as the shot blocker. With the coil cryogenically cooled, any water molecule moving off the surface has a much better chance to hit the Polycold coil than the inlet of the pump. The more surface area of the coil, the better chance to be "blocked" and trapped by the cryogenic Polycold coil. Once trapped on the Polycold coil that water molecule is no longer "in play" inside the chamber and stays on the coil until the next regen cycle. Installing a Polycold in your high vacuum system pays great benefit in reducing the high vacuum pump down time of the chamber by up to half. This can result in extra coating runs per day and thus more $$ profit. Schoonover can work with you to provide a turn key solution that includes, rebuilt Polycold, coil design, coil fabrication and installation. 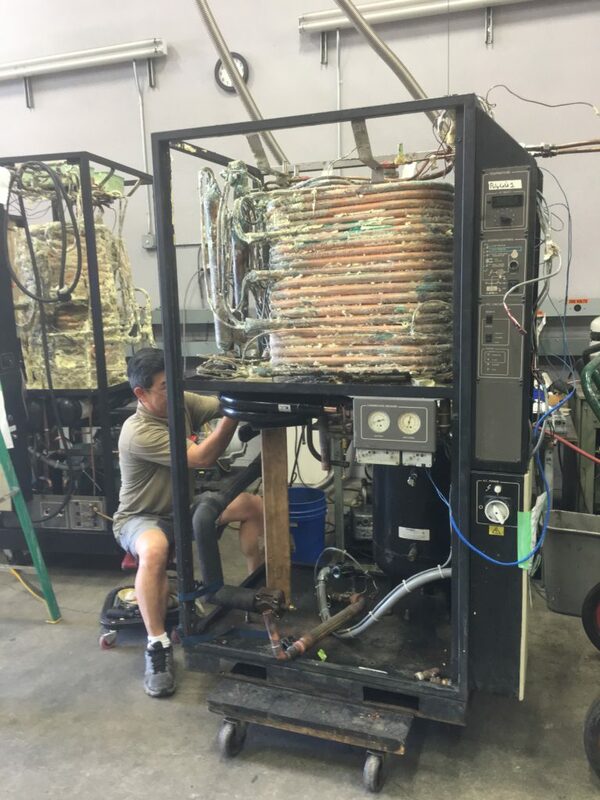 Utilizing a rebuilt Polycold instead of new provides a long-term "good as new" solution with a total price (Polycold, coil and install) usually at or less the cost of a new Polycold. So more bang for your vacuum pumping buck. Visit us at www.schoonoverinc.com and contact us for more information on this cost saving addition to your coating system.